...if you are reading this, welcome! If you're reading this before it was announced anywhere, then you are super-awesome and amazing and probably a ninja. Yes, this will be a new blog for Kirsten's Adventures. That Cheap Lady won't update it as often as some people want, I know, but it should be much easier for her to update SOMETIMES, at least. Or if not, then I know how to use Blogger much better than I know how to use a cheap ghetto HTML program like that Cheap Lady uses. So hopefully we can get some adventures on! Which is good because I've had some interesting adventures!!!! I've also got a bear. But you'll have to wait to hear about him. Mwa ha ha ha ha. Did that laugh come out sounding evil? I'm not used to typing evil online. 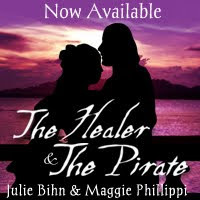 For now, you can get caught up with the old adventures online at http://juliestudio.com/kirsten. Hope to see you soon! I'll post when I know when we'll get a new adventure up. I am so pleased to see that you and Miss Cheap Lady (who is really my friend, and I like her very much) are going to be blogging. I shall look forward to reading your adventures here! We want more of the Evil Kirsten in the mirror! Is there an Evil Nellie and an Evil Nellie and Evil May and Evil Pegleg Sally? P.S. More of you, too, and of Ghost Girl Constancy!